Global Supply Chain Management Takes Flight - E2open | Demand. Supply. Delivered. With 135 structural and systems partner locations around the world involved in the manufacturing and fabrication of the airplane, coordinating the end-to-end supply chain across these partners is paramount. 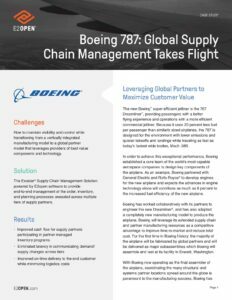 The Exostar Supply Chain Management Solution, powered by E2open, allows Boeing and its partners to collaborate and manage inventory consumption across the multiple tiers involved in the manufacturing process.